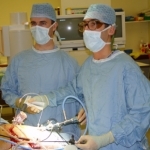 Thyroid, Parathyroid, Adrenal, Endocrine Surgery, How are adrenalectomy operations performed? The details of these operations are discussed here in more surgical terms with pictures of surgery. All are performed under general anaesthesia. This is now the preferred technique for adrenal surgery in most cases as it is minimally invasive and patients recover quickly with minimal scarring. It has been facilitated by the advent of sophisticated digital laparoscopic cameras and lighting systems, and the development of specialist surgical instruments that can be introduced into the abdomen via small holes. It is suitable for most benign (non-malignant) tumours, but larger tumours and malignant tumours need to be removed by an open technique. The precise operation depends on the surgical condition, but Mr Fleming's standard approach is described below. The patient is placed on the operating table in the lateral position, with the affected side uppermost, and the table 'broken' to allow maximum distance between the costal margin and the iliac crest. The initial port is inserted safely using a blunt Hasson technique and a 30 degree laparoscope introduced. Carbon dioxide gas insufflation is then commenced under direct vision. Two more ports are inserted on either side of this initial port, again under vision to prevent injury to intraabdominal organs. The three ports are equally spaced in a line, from the lateral edge of the rectus sheath of the affected side to the anterior axillary line, just below the costal margin. An initial exploration of the abdomen is made using the camera to assess the anatomy and decide how best to proceed. Instruments are then introduced through the other two ports and the adrenalectomy can commence. The first step is to mobilise the liver by dividing the attachments on the lateral border right up to the bare area. This allows gravity to take the liver anteromedially, aided by the use of a liver retractor, introduced via a fourth port which is inserted further anteriorly. The adrenal and its contained tumour should now be visible with its distinctive yellow colour. The hepatic flexure of the colon usually does not get in the way, but can be mobilised anteriomedially if necessary. The posterior peritoneum is now opened just below the liver and a space created with the harmonic scalpel along the top of the adrenal and proceeding down the lateral edge of the inferior vena cava (IVC). Occasionally there are some small veins draining from the adrenal, at this top edge under the liver, that need to be divided. Proceeding down the lateral edge of the IVC and opening the space between it and the adrenal will expose the adrenal vein which should be isolated and double clipped with titanium clips before division. In the case of a phaeochromocytoma the anaesthetist needs to be warned before the vein is divided, to allow appropriate preparatory steps to be taken to prevent a sudden drop in blood pressure as the catecholamine source is stopped. Once the vein is controlled the adrenal arteries and other attachments are divided with the harmonic scalpel. Occasionally a larger vessel is encountered and will need to be controlled with a titanium clip, but often the small arterial branches are not seen at all. When the adrenal has been fully mobilised it is removed from the abdomen in a bag. Haemostasis is then secured after a thorough washout and the wounds closed. A drain is not usually required. Patient position and port placement are of course on the opposite side, and a fourth port is usually not needed. The operation begins by taking down the splenic flexure of the colon with the harmonic scalpel, which exposes the spleen. The lateral attachments of the spleen (the lieno-renal ligaments) are then mobilised right up to the diaphragm, which is a critical step to obtain the best exposure. Gravity then takes the spleen forward and the tail of the pancreas with it, which brings the adrenal and its tumour into view. The procedure is in principle the same from here as the right adrenal, aiming to isolate the adrenal vein as it drains into the left renal vein on this side, and ligating it with two titanium clips before division. The operation then proceeds as with the right adrenal, using the harmonic scalpel to divide the arterial vessels and attachments before removing the gland in a bag through a convenient port. A washout is then performed and haemostasis secured before the wounds are closed. A drain is rarely needed. Importantly in laparoscopic adrenalectomy, the surgeon should also be expert in the standard anterior approach should complications arise in surgery requiring opening of the abdomen. A midline incision or bilateral subcostal incisions are made to access the abdomen. Initial exploration of the abdomen should be made for evidence of metastatic spread and provides an opportunity for biopsy or excision of suspicious lesions to be made. The mobilisation and operative details are similar to the laparoscopic approach, apart from the larger single incision. First the right lobe of the liver must be mobilised and retracted anteromedially. Then the hepatic flexure and transverse colon are freed and retracted medially. The duodenum and head of pancreas are then elevated (Kocher's manoeuvre) to expose the inferior vena cava (IVC), aorta, the right kidney and the right adrenal gland. The retroperitoneal space is then entered and the adrenal fully exposed. Starting from the superomedial aspect, the adrenal gland is then dissected out and the smaller feeding arteries clipped and divided from the gland using an ultrasonic dissector. A careful dissection of the IVC posterolaterally then allows the right adrenal vein (which unlike the left adrenal vein drains directly into the IVC) to be identified. This is then ligated with double titanium clips or a tie and divided close to the IVC. The major feeding arteries are then controlled and divided, this time proceeding from the superolateral aspect medially. The gland can then be removed. The left colon is first freed from its peritoneum and reflected down inferiorly. Then the spleen is delivered medially from the left upper quadrant to allow the division of the splenocolic ligament and its mobilisation. This allows retraction of the stomach, the pancreatic tail and the spleen medially, exposing the left kidney and the left adrenal gland. The left adrenal vein, which drains into the left renal vein, is ligated and divided close to the renal vein. Arteries are then divided starting superolaterally and proceeding medially until the gland is entirely freed for removal. A standard abdominal closure concludes the operation. This is essentially the same as the anterior approach but involves more extensive thoracic exploration for removal of large and malignant tumours to minimise the chance of leaving malignant cells behind. This is a less extensive operation, with incisions being made in the back. The patient is obviously prone (on their front) but flexed at the waist to encourage descent of the abdominal organs away from the retroperitoneum, minimising interference in the surgical field. The operation is the same for the right or left adrenal gland. An initial incision is made in a curvilinear fashion from the midline at the level of the 10th rib inferiolaterally to the superior border of the posterior iliac crest. Then the surgeon dissects down through the fat and latissimus dorsi muscle to the thoracolumbar fascia. Here, a longitudinal incision is made, exposing sacrospinalis muscle that is retracted medially. The 12th rib and its associated vascular bundle are retracted as medially as possible. The 12th intercostal nerve is then retracted (gently) superiorly exposing the retroperitoneum. This is entered and the diaphragm elevated from Gerota's fascia (the fascia lining the kidney). The pleura is then separated from the diaphragm and the diaphragm is divided to allow access to Gerota's fascia. This is then incised, the kidney retracted inferiorly to expose the adrenal gland, allowing the adrenal to be isolated. Clipping and division of arteries proceeds from the superior aspect inferiorly. The adrenal vein is then ligated (either at the left renal vein on the left or the IVC on the right) and the gland freed proceeding from superior to inferior, followed by removal. The diaphragm, muscle and fascia, and skin are then repaired.